Cool Camping has made its name from eschewing big camping brands and holiday parks and, instead, picking out the best independent campsites and glamping sites across the UK, France and Europe. France, in particular, has always been a hot spot for commercial giants with euro-park style chains dotting the coast. Aqua parks, discothèques and 1-million-pitch behemoths aren't really the kind of thing we go in for. For us it's all about friendly, personable campsite owners, natural camping pitches and a traditional game of boules beneath the warmth of the French summer sun. It's fair to say, however, that when researching for the third published edition of Cool Camping France, we were pleasantly surprised to find a large-scale camping brand that was conscientiously avoiding the usual, man-made, 'camping for the masses' approach. 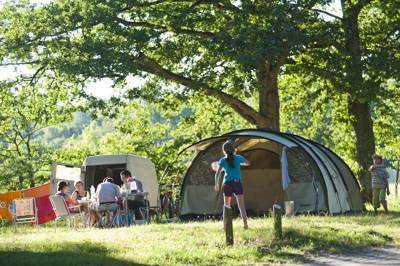 Huttopia, now with around 30 campsites across France, has spent the last couple of years renovating old campsites but with the focus wholeheartedly on nature. They've kept traditional tent camping at the fore and some of their best campsites are unashamedly tent, rather than caravan, friendly, such as those in the dunes of the Atlantic coast, with tent pitches among the loose, sandy soils and tall pine trees. Huttopia happily confess that some pitches can be 'lumpy' and encourage you to check for knobbly roots when you pitch your tent. "That's nature", they say. They're not in favour of laying down concrete to avoid it. Before long, a handful of the new Huttopia sites had made it into the pages of our newest guidebook – a select collection of 100 exceptional campsites in France – along with many more that appear on the Cool Camping website. Their campsites are certainly on the larger side – some have over 300 pitches in total and can accommodate campers, caravanners, motorhomes and glamping alike – and they don't fall short on facilities either. Yet while there are inevitable drawbacks to large, staffed campsites, these Huttopia locations really do manage to offer the best of both worlds. Facilities are plentiful and well-kept by a team of friendly staff, while the atmosphere remains laid-back. There aren't heaps of rules and the naturally rich locations of so many Huttopia sites make them a boon for traditional campers, particularly families. Set on a mile-wide strand of land between Lac d'Hourtin and the Atlantic Ocean, this pine forest campsite in the dunes of France's west coast is ideal for sun, sea and sand. When the heat gets too much you can retreat to the shade of your pitch, grab an ice-cream from the campsite café or take a dip in the lake itself. But when you do fancy leaving the site, it's an easy walk or cycle ride to the beach, through the trees of Bombannes Forest. Only 20 minutes from the Eiffel Tower and with the Palace of Versailles even closer – an easy 3 km walk – Huttopia is still enjoyable for more than location alone. There are just over 100 camping pithes, with facilities housed inside warm timber buildings – one is even heated by a classic wood-burning stove. There's a swimming pool and café, too, and the partially wooded setting helps shield it from the urban environment giving it a surprisingly hidden feel. On the banks of the River Loue, this campsite is mecca for water-lovers who'll enjoy the swimming facilities, while there's also an activity centre right next door. So if you're feeling sporty, or simply want to wear out the kids, Plage Blanche should be top of your list. Cycle the riverside pathway or take a canoe or kayak out for the day. A little further east the land begins to crumple towards the Alps, making this a great stop-off point for campers en route to a mountain holiday. Few campsites capitalise on the rich history of the Loire Valley quite like Les Châteaux, one of Huttopia's largest campsites (there are over 300 pitches) on the banks of a tributary – the River Beuvron. As the name suggests, there really are dozens of châteaux within striking distance of the campsite. Magnificent Chambord – the most famous of all the castles in the Loire valley – is just 8km away, Chevenry is 9km, the Royal Château of Blois 18km and it’s a half hour drive to Chaumont-sur-Loire. Take the scenic route to the beach from this south of France campsite and you can enjoy the wildlife of a nearby nature reserve too – Réserve Naturelle du Courant d'Huchet. It's a 14km cycle to the coast, though there's a swimming lake at the campsite, if you'd prefer simply to stay put and relax. There are around 200 pitches in total, most set among a pine forest with various natural tiers creating flat, spacious areas. As one of the newest sites, facilities are excellent and include a central lodge with free Wi-Fi, a small shop, library and games corner, along with a heated outdoor swimming pool. Bikes are available to hire.